All images and text copyright Martin Webster, all rights reserved.. Permanent installation at the North Carolina Arboretum, Asheville, North Carolina. 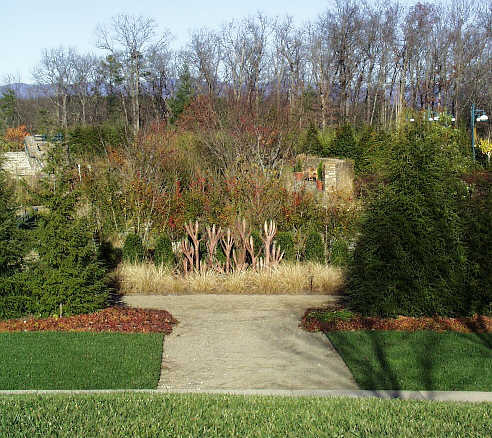 In June 2000, The North Carolina Arboretum hosted the first World Botanic Gardens Congress. 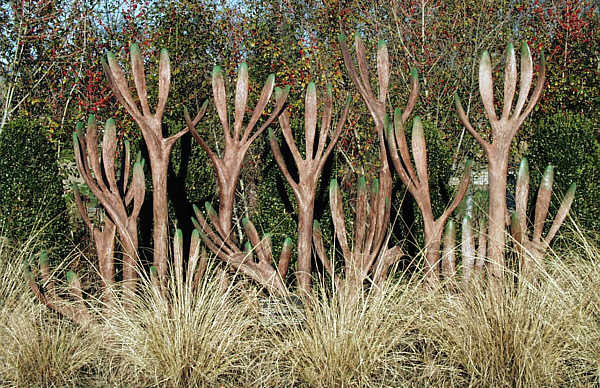 To highlight the conservation theme of the event, the Arboretum sponsored a juried sculpture exhibition that included A Hedge against Extinction. Through the generosity of an anonymous donor, this artwork was acquired to commemorate the Congress. Artist's Statement - short version: Shifting resources to guard against loss is sometimes referred to as a hedge - a hedge against inflation, for instance. This sculpture honors the coordinated research, preservation, education, and advocacy of the international network of arboreta and botanical gardens. Their work is an investment to avoid the loss of plant species and ecosystems - a hedge against extinction. Are the green tips on these brown branches all that's left, or are they the beginnings of a new greening? The answer is in the hands of those who tend the garden. Artist's Statement - full version: Investors (and other gamblers) in their more prudent moments may take precautionary steps to reduce their risk of losing everything. Shrewdly shifting resources to guard against a catastrophic loss is sometimes referred to as a hedge - a hedge against inflation, for instance, or a hedge against commodity price volatility. Humanity, unwilling to reverse population growth and hell-bent on development at any cost, is gambling with an asset infinitely more valuable than the stock market: the biodiversity of the planet. With society as a whole indifferent to the magnitude of the stakes being placed so casually on the table, it falls largely to institutions such as botanic gardens to study, preserve, educate about, and advocate for the voiceless splendor of our biological heritage. Throughout the world, the staffs and supporters of these gardens work to understand and protect our natural riches, species by species and ecosystem by ecosystem. Their investment is a hedge against extinction. This sculpture honors those who stand together to nurture and share the treasures of Earth's plant life. In the sculpture's stylized shrubbery, leaves are also upraised hands. Some of the hands shout "Stop! ", pleaing for ecological sanity. Some reach out in cooperation. Other hands give freely, like the dedicated professionals of the world's botanic gardens who give from a lifetime of knowledge and skill, and from their hearts. The interlinking pattern makes it clear that coordinated, overlapping growth is most effective at closing gaps to prevent unbearable losses. Just as the configuration of a real hedge arises primarily from the impulses of individual stems reaching for the light, so it is that much of the strength of the worldwide work of botanic gardens is in the local wisdom about what is of the most profound value in each place, and the local determination to defend and promote what is sacred there. Just as some judicious shaping and nourishment can enhance the health and function of a hedge, so it is that the World Botanic Gardens Congress provides opportunity for a renewal of shared vision that can revitalize the network. Are the green tips on these brown branches all that's left, or are they the beginnings of a new greening? The answer is in the hands of those who tend the garden.